This is our Giantex 38''Foldable Mini Band Trampoline which provides more convenience and fun to bounce and work out. It features sturdy construction and safe design. The whole frame and legs are constructed of rust-resistant and durable metal which maintains years of use. The six legs with protective rubber feet ensure stability and balance and protect floor from being scratched for indoor use. The jumping mat is made of high-resilience PP material and connected to the trampoline edge with manysprings, which ensures your safety while you are enjoying your jumping time. It comes with thickly padded cover for its no-pinch springs and large rubber feet for stability. The foldable design is convenient for storage and maintenance.High Quality with competitive price can be realized here. It will be worthy of your choice! 【Easy to Assemble and Disassemble】- Detailed manual and complete accessories gives you much assistance in assembling the trampoline well. Due to its folding design, it is also easy to disassemble it for storage with black carry bag. 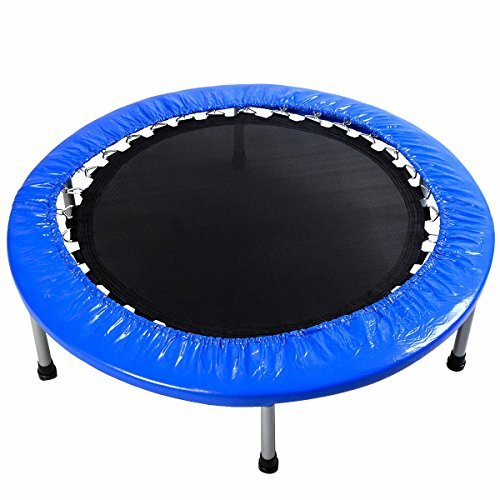 【High-Resilience Jumping Mat with Powerful Capacity】- The jumping mat are connected to the round edge with lots of springs which gives powerful support to the jumping mat and the whole trampoline. The jumping mat is made of high-resilience PP material and is spacious and flat, which makes you fully enjoy your jumping experience and ensures your safety. 【Six Metal Legs and Detachable Rubber Feet】- Ensuring Safety and Balance- Six metal legs are evenly distributed and assembled under the trampoline. This greatly disperse the weight from the trampoline and person jumping on it. The rubber feet make the trampoline to stand more stably and protect your floor if it is put indoors. 【Indoor and Outdoor Exercise】- The size of this trampoline is suitable for both outdoor and indoor usage, which enable you can enjoy your jumping time even though it is rainy. 【Protective Safety Pad Giving Dual Protection】- The safety pad perfectly cover the trampoline round edge which protects users especially kids from scratching their hands by metal edge and prevent you from hurting your body when falling.